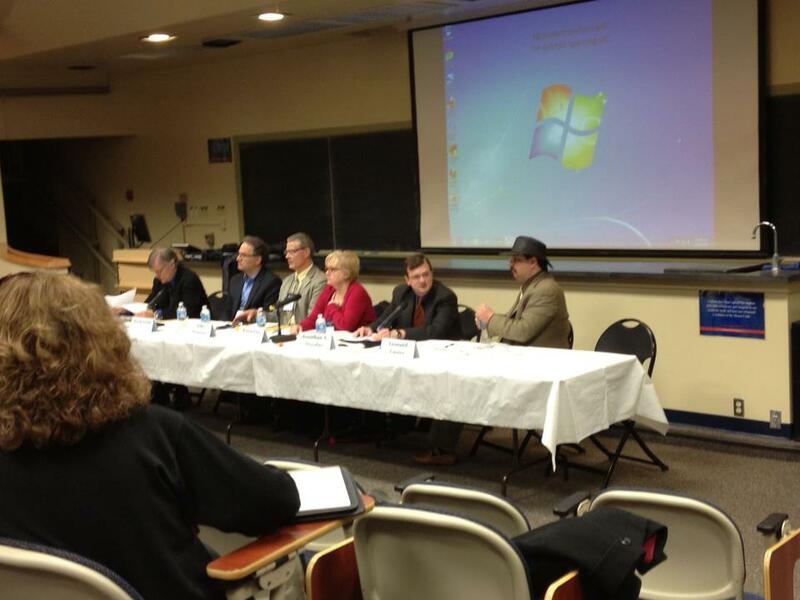 I had the pleasure of joining numerous historians at Gettysburg College this past weekend for The Future of Civil War History: Looking Beyond the 150th conference–a meeting that considered how we can better interpret the American Civil War to gain a fuller, more complex, and multilayered understanding of its impact on the nation and its people. During this, the sesquicentennial of the war, the conference sought to set a far different tone than the celebratory centennial (1961-1965), which many scholars have noted was swathed in the rhetoric of the Lost Cause. (L-R) David Blight, Kevin Levin, John Hennessy, Karen Cox, Jonathon Noyalas, and Leonard Lanier. This gathering at Gettysburg certainly set a different tone as it brought together public historians and academic historians to tackle issues of memory and history, of slavery and gender, of trauma and even the smells and sounds of the battlefield. I participated in the session “Interpreting Issues of Civil War memory for the Classroom and Museum Audiences,” alongside Kevin Levin, who maintains the very successful blog Civil War Memory, Jonathan Noyalas, an instructor at Lord Fairfax Community College, John Hennessey of Fredericksburg & Spotsylvania National Military Park, and Leonard Lanier, assistant curator at the Museum of the Albemarle (NC). Our moderator was David Blight of Yale University and author of the very important and influential book Race and Reunion: The Civil War in American Memory. One audience member asked us if we were doing a better job of interpreting the Civil War during the sesquicentennial. Time will tell, but I’d like to think that given the vast array of subjects covered at this conference that we’ve more than improved on the discussions held during the centennial. I’m a Westerner, born and reared, so I can’t understand why we as a nation continue to study, discuss and even reenact this war. After 150 years, is there really anything new to be learned, or anything to be gained by learning it? I am genuinely curious to know. All I can say is “yes.” Unless you were there, it’s hard to explain. Each time I think it’s been done to death, someone offers a different interpretation. That’s the thing with history. The facts remain the same, the interpretation is what differs. Also, so much new material is being written about women and slavery that it simply cannot be ignored. Are there any videos or transcripts available of your panel or any other discussions during this conference? No transcripts are available for my panel. C-SPAN did film some of the panels and you can find them there.